This bright, spring-like day in New York City made me think of this post from the past. Enjoy! If you're experiencing a gray, slushy day like the one in New York today, this cheery setting from The Find: The Housing Works Book of Decorating with Thrift Shop Treasures, Flea Market Objects, and Vintage Details might brighten your day. 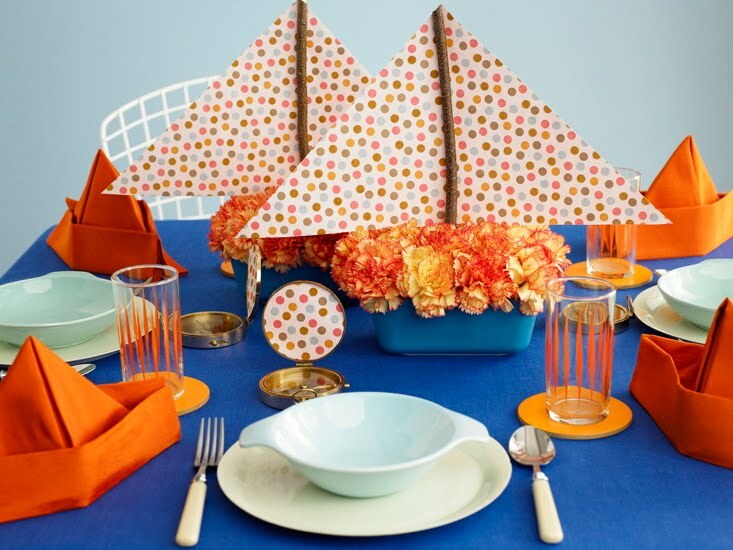 Created by acclaimed wedding designer Michelle Rago and photographed by Jim Franco, this table stands out to me for the way Michelle used everyday, inexpensive objects to create a tabletop that is bright and sunny. Even the lowly, deli-type carnation is glorified in a vessel of blue refrigerator glass resting under a sail of craft paper held high with a found-in-the-yard twig mast. The glasses are the kind that I find at garage sales for about $1 a set, or maybe a quarter apiece. And then the final touch comes with the cloth napkins -- hopefully ones you have on hand. Fold them into sailors hats and we're ready for smooth sailing! The Object of My Desire: Snow Day! It's rare that I see an estate sale listed in Manhattan, so when I saw one advertised on lower Fifth Avenue, I had to go. It was a snowy Saturday -- the first since October -- and my LA garage sale-ing buddy, Ruth Handel, was in town, so we bundled up and made our way a few blocks to see what finds might await us. To put it conservatively, the gracious, three-bedroom apartment was packed with everything. The woman who was moving out was a celebrated decorative artist who specialized in découpage objects. There were stacks of gorgeous paper from around the world, boxes of porcelain hands, masses of colorful prototype boxes, vintage shoe lasts, craft books, stamped metal medallions, glass domes and planters. You name it, and it was probably there. Under the heaps of treasures that teetered as shoppers picked through them, I spied a box that had yet to be opened. When I lifted its lid, I discovered hundreds of crisp, crocheted snowflakes in pristine condition. 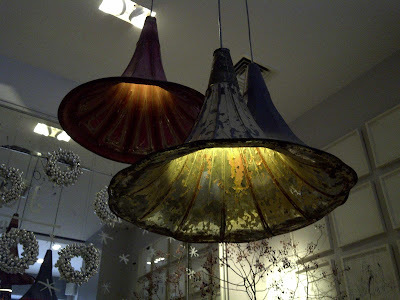 The original owner's son told me that his mom made them for the windows of Henri Bendel. He then handed me another box filled with the prototypes she had made out of tan thread with metallic flecks. Of course, I took them all. After three hours, the apartment started buzzing with activity, so it was time to go. Out we went into a the sparkly, pure-white snow with an awesome array of goodies and I my own winter wonderland under my arm. Spotted on a metal step in SoHo: three wooden platters and three glass candleholders. Where do you think the party went? What to do with empty wine bottles and a whisky-less Jack container? 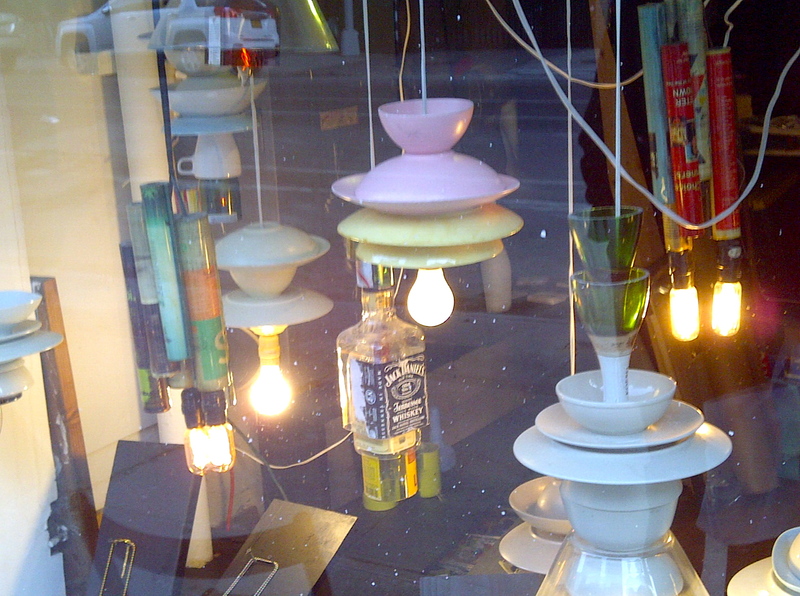 Why not mix them with an array of dishes and turn them into hanging lighting pendants, as seen here in the window of the East Village's Brow NY. I'll drink (or have a bowl of cereal) to that! As Valentine's Day approaches, I'm looking for inspiration in these vintage cards found at a yard sale on the Jersey Shore. Don't you love the the sweet motifs and cheerful messages that these Valentine's convey? In a future post, I'll show you what I dream up. 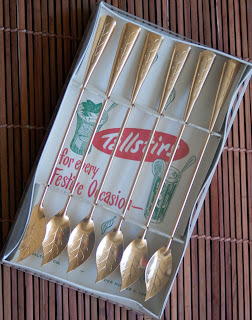 Here's a post from the past that shares one of my favorite vintage finds -- keys! 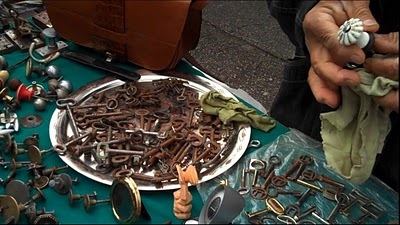 One of my favorite photos from The Find: The Housing Works book of Decorating With Thrift Shop Treasures, Flea Market Objects, and Vintage Details is of a tin tray holding a collection of rusty skeleton keys discovered at the Alameda Point Antiques and Collectibles Faire. Today, the platter of keys I'm sharing are ones I found a while back at Britanski Trg's flea market in Zagreb, Croatia, demonstrating that wherever you go in the vintage and thrift world, you'll always find the familiar at the most unexpected moment. 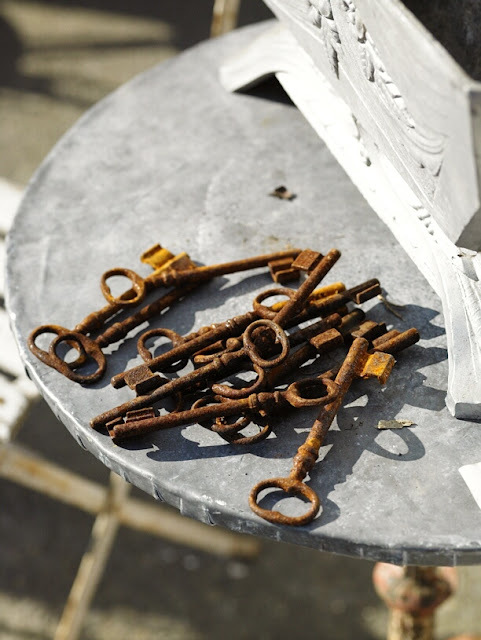 Even if you've only attended a couple of flea markets, you've seen the plentiful population of old skeleton keys lying here and there, instantly opening all kinds of thoughts about what they could symbolize, how they might be reused and what they've seen in their lives. Is that mismatched jumble of keys made up of ones that strayed from their owners? Could they be duplicates that got stashed in an attic or cellar? Or were they rendered useless by new locks or entire door replacements? I also start to think about all those familiar sayings that make use of the word "key: "
"The key to success;" "The key to the future;" or "The key to my heart." And then I imagine uses for a patina-enriched skeleton key: a hanging door knob ornament; a piece of jewelry; a mounted collection framed as wall décor; or even a whimsical potted plant accessory. I find old keys alluring for the mystery they evoke. What might they have witnessed while lodged in an old door lock? Whose hands have turned them? And where have they been hiding out over the past several years? As for my house keys, they seem to have a life of their own, appearing in the most unlikely places other than where I believe I left them. What do old keys make you think of? I love it when my favorite garage sale pal from LA, Ruth Handel, comes to town, giving me an excuse to wander around like a tourist and take in the city from a whole new perspective. 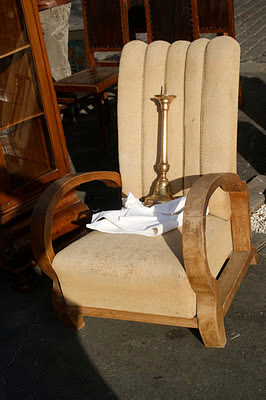 As thrift karma would have it (and I have been very good this year! ), I discovered a listing for an estate sale on lower Fifth Avenue, and of course we trudged our way through the snow just a few blocks away to see what we might find. What we saw blew both our minds. The gracious, three-bedroom apartment was packed with the belongings of a well known decorative artist, and Ruth and I sifted for three glee-filled hours through what appeared to be a lifetime of craft-making. This is just a sampling of Ruth's finds, all waiting contently in my apartment until shipment to her home in Los Angeles. Along with the vintage macrame materials, a children's drawing book from the 1940s and an antique Singer sewing box, you can see the artist's decoupage boxes sitting inside a carton once used to carry a peck of tomatoes. It's raining in New York today, making the idea of a trip to the post office quite unappealing. So until the weather clears -- and I find the appropriate box -- I'll enjoy Ruth's treasures for a few days longer and remember her much-too-brief visit to New York City. Reuse and Repurpose: Cool and Cozy! Almost every time I peruse a flea market or stop in on a garage sale, it seems like there is always a colorful, crocheted afghan. 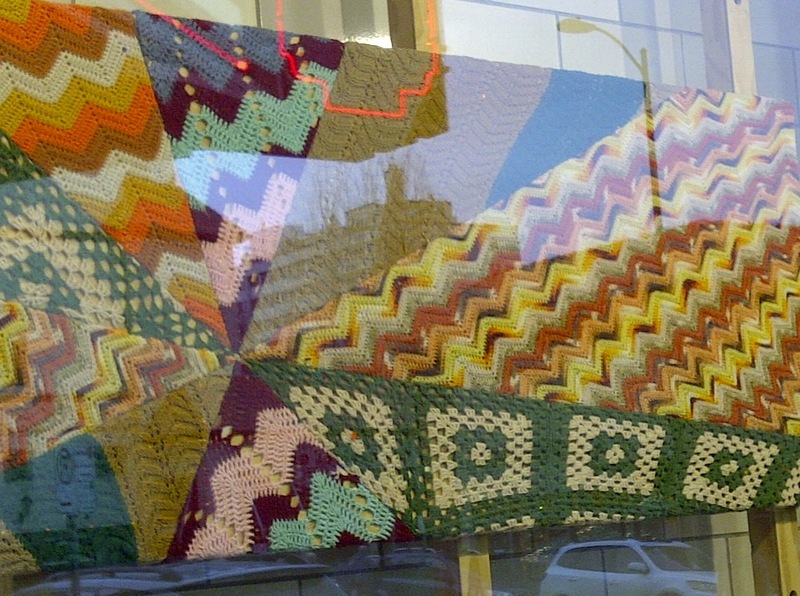 I'm always drawn to them, since they remind me of all the crocheted blankets and throws that were made by my own family members in the past, not to mention the time, energy and love that went into their creation. But let's face it, there are only so many of these handmade lovelies you can pile on the back of a sofa or place at the foot of a bed. What if you could repurpose them into something new and fresh, other than a way to keep your feet warm while lounging at home? That's why I was drawn to this unique display spotted in the window of an Urban Outfitters store in Kansas City. Made of discarded crocheted afghans, this cozy-yet-cool wall décor creation puts a modern twist on a time-honored tradition. When shopping for the Gift of Thrift, the opportunities of offering a personalized present are endless. Take, for instance, these Stanhome pressed aluminum coasters from the 1950s that my sister snapped up at an estate sale and gave me for Christmas. Can you imagine a better home for them than mine? 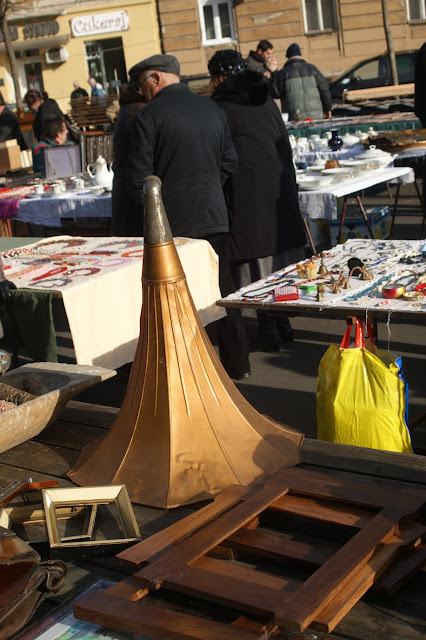 Yesterday when I shared with you this image of a horn from a Victorian Victrola spied at a flea market in Zagreb, Croatia, I promised to show you how a creative twist could turn it into an illuminating eye-catcher. How about turning it into a creative lighting fixture and cluster them in threes just like the clever Croatian florist and stylist Saša Šekoranja did in his hip and trendy coffee shop, Velvet Caffe. 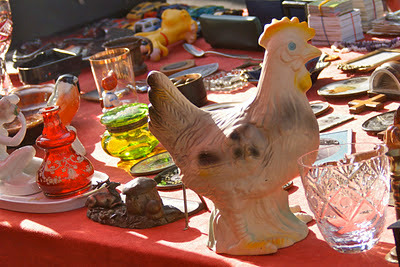 Many people think that when I go to flea markets, I go crazy and buy everything in sight. But for me, especially when perusing a venue with high prices, I'm happy to walk away with photos that remind me of my adventure. Such was the case when I visited for the second time the market on Britanski Trg (British Square) in the capital city of Croatia -- Zagreb. We were first attracted to this table filled with industrial looking fixtures, a globe and a German clock. The vendor wanted $80 for the time keeper, which was interesting but was battery-operated and not that old, so I knew finding items at this market within my thrifty budget would be a challenge. When I marveled over this Eastern European chair, I dared not ask the price but imagined how wonderful it would look in the corner of my living room -- recovered and refinished, of course! And I couldn't help but chuckle over this rubber (yes, rubber!) chicken guarding the treasures in this display. I almost inquired further about this crystal-filled, brass fixture, which was just under $100, but quickly decided that a picture would do. 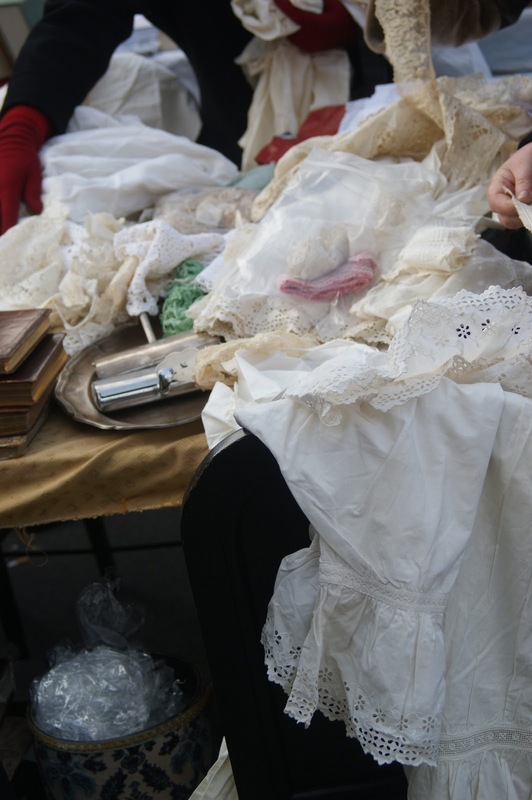 And I had to really restrain myself from diving into a pile of lace that several ladies were rummaging through. Some vendors attempted creative vignettes, such as this vintage, Marie Antoinette tin matched with other lady-like accessories. And then, of course, there were unusual pieces I don't run into every day, such as this old Victrola horn. Tomorrow I'll show you how someone took a similar object and turned it into a spectacular focal piece. On a cold January day a couple of years ago while stuck indoors, I decided to amuse myself by creating a tabletop that reminded me of the warm days of summer. Here's a post from the past that cheered me up on that chilly winter afternoon. There's nothing that makes me long for those sunny, summer days more than the frigid, short spans of daylight that take over the winter months here in New York. So intense was my desire to bring those lazy-daisy, warm-weather moments spent aboard The Luxor to the present that I started gathering up items that reminded me of her and the way she gracefully creaks and moans as gentle waves rock her to and fro. I remembered that in my kitchen cupboards sat a group of six vintage sailboat glasses, purchased for $5 at a thrift shop way out on Long Island. 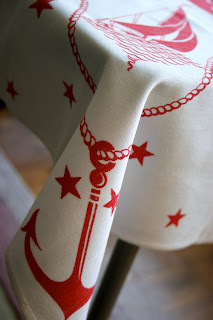 Next, I raided my linen drawer in search of a nautical themed tablecloth that I picked up for $1 at a garage sale in LA. I'm especially attracted to this bright and cheery cloth because it's specifically made for a deck table, measuring only about four by four feet. And then I reached for an adorable metal cocktail stirs whose shiny finish accents the shiny trim of my drinking glasses. 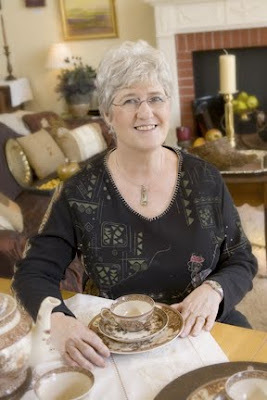 Those golden vintage treasures were a gift from the delightful Andrea Prestridge in Austin, Texas. I gathered up all my nautical treasures and set them up in my apartment as if I were going to serve a tray (a vintage Couroc of Monterey with inlaid coins, which was a gift from interior designer Randall Beale) of iced tea to guests visiting our old 1966 Chris Craft bobbing in marina on Fire Island. And as the sun streamed through my Western windows illuminating my summertime table, for a moment, I felt I was there, too. Pull up a captain's chair and join me for a while, won't you? Having just spent the holidays with family in Independence, Missouri, here's a post from the past that features a friend from my hometown. 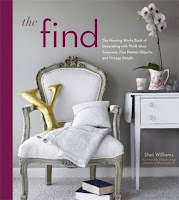 While researching The Find: The Housing Works Book of Decorating With Thrift Shop Treasures, Flea Market Treasures, and Flea Market Objects, it should have come as no surprise that I would find inspiration in my hometown of Independence, Missouri. My sister told me about a shop on the historic Independence Square that she insisted I had to see. And there, sitting across the street from the cinema I remember from my childhood, was the delightful Luticia Clementine's. As soon as I walked through the front door that jangled with the sounds of a chime handmade out of silverware and a china plate, I was hooked. I marveled at the creativity of proprietor Sharleen Reeder and the way she took garage sale and thrift store discoveries and re-fashioned them into true treasures. And so impressed was I with her skill and wit that I included her work in the pages of The Find, even though this amazing photograph of Sharleen by Bob Greenspan did not. 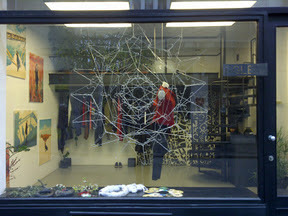 Here are some photos of items I took on my first visit to Sharleen's amazing shop. And every time I gaze at them I'm reminded of Sharleen's magic touch that breathes new life in the discarded. And a pair of silver spoons serves up new service as witty window accessories. As you know, I love anything that reminds me of Paris, and that's why I particularly like this post from the past. It's impossible for me to pass an Eiffel Tower in a New York shop window without snapping its picture to remind me of my favorite city on earth. 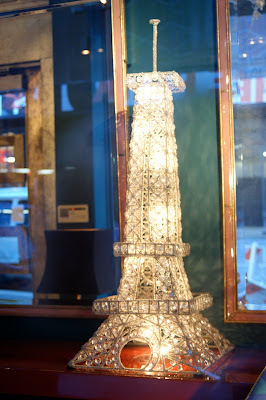 This tower, which appears to be made of metal, wire and light bulbs, stands proudly in the Alan Moss Studios, projecting stately Parisian grandeur from its glorious perch. Combined with the malachite-green wall and the gold framed mirrors, I was immediately reminded of the legendary interior, movie-set and jewelry designer Tony Duquette, a man who I think would have happily raided an 99-Cent Store for window props or trolled the beach for washed up detritus and turned them into glowing decorative accessories. 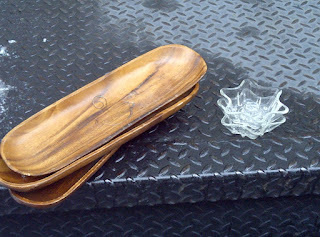 In the most recent Tony Duquette book, "More is More," by Hutton Wilkinson, it tells how the designer once made mandalas out of "strips and thongs from rubber sandals, horseshoes, seashells, nut shells, bits of a white plastic wastepaper basket, strands from a dismantled gold plastic purse and metal juice squeezers." Now I'm most certain that this is not a Dollar Store creation, being that it is twinkling in the vitrine of one of New York City's most pricy antiques stores. Even so, this glamorous Eiffel Tower shows how a shimmery finish of gold and a sparkly addition of carefully places lighting can turn the simplest looking materials into a world-class attraction.